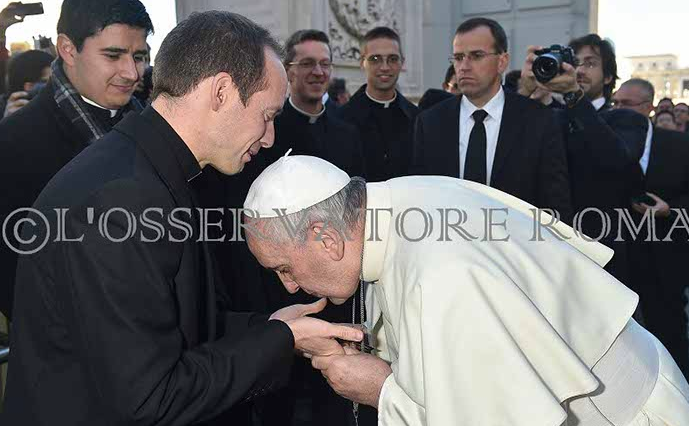 Thirty-five newly-ordained confreres of mine were very excited about being greeted by Pope Francis yesterday during the general audience, but I do not think that any of them expected how he chose to greet them: in an amazing reversal of protocol, he bent over kissed each of their hands. Breaking protocol is nothing new for Pope Francis – we all remember how he caused a stir when he bowed to the Queen of Jordan – but I think that yesterday’s gesture was particularly significant. Traditionally, one must greet the Pope by kissing his ring (which is hard to do with Pope Francis, unless you duck in before he pulls his hand away), so what does it mean when the Vicar of Christ himself kisses the hand of a priest? I have been thinking about that since yesterday. Many of the new priests are friends of mine whom I have known since my days in minor seminary and in the novitiate. I got to know some of them pretty well, so it was especially awesome to watch them be transformed instantaneously from ordinary men, with qualities and quirks like anyone else, into ordained ministers, “other Christs”. These comrades of mine with whom I have lived, worked, and prayed for years are now sacramentally identified with the Second Person of the Holy Trinity: a profound ontological change has occurred in each of them. They now have the power to act in persona Christi: with a word, they can transform bread and wine into the Body and Blood of Christ, and with another they can wipe away decades of sin. Yesterday morning, ordinary eyes would have seen only 35 men going to meet the Holy Father, but Pope Francis does not have ordinary eyes – he has eyes of faith. 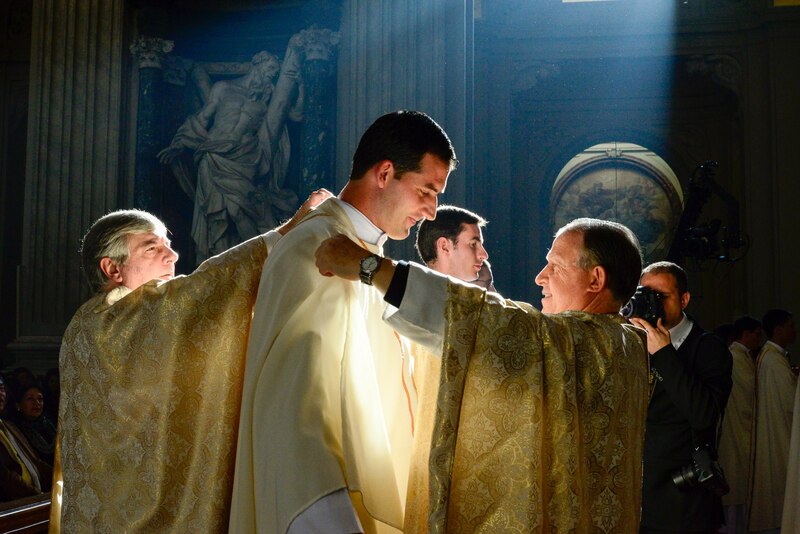 When he looked at that group of fresh new priests, he saw Christ: he bowed to reverence his Lord who had deigned to make Himself present in each of those men and he humbled himself before the One whose Vicar he is. Anyone who has done a tour with me of St. Peter’s Basilica will know that the first thing I point out is a large circle of imperial porphyry near the main entrance. Imperial porphyry is extremely rare and expensive (all of the quarries have been exhausted), so why is it not roped off? Why is it that anyone who wishes may step on it? The answer is impressive. On Christmas Day, 800 AD, Charlemagne, the first Holy Roman Emperor, was crowned by Pope Leo IV on that very stone. For centuries, the only person allowed to touch it was the emperor himself. However, it has been moved to its current position for a very significant reason: all baptized Christians participate in the kingship of Christ, and therefore, all of us have a right to tread upon royal ground. We are “a chosen race, a royal priesthood” (1 Peter 2:9); we share in Christ’s threefold mission as priests, prophets, and kings. It is truly marvelous to think that we are all royal priests: by virtue of our baptism, we are mediators between God and the world. We can carry out three essentially priestly functions of worship, intercession and sanctification. By living our lives as well as we can for the glory of God, we offer worship to our Creator; by offering up prayers and sacrifices, we intercede for ourselves and others; by ordering our work and relationships towards God, we sanctify all that we do and the people with whom we live. Obviously, there are some roles that are unique to those who have been ordained to the ministerial priesthood since only they can administer the seven sacraments. However, this does not negate the fact that we participate in Christ’s priesthood in a very real way: just as Christ, the God-man, is the bridge between God and men, so are we called to be instruments through whom others are able to come to God. If we look at our lives with eyes of faith like those of Pope Francis, they will never seem boring or unfulfilled – how could they be when we are royal priests? When we see life from this perspective, even the most ordinary things become extraordinary: waking up in the morning, getting ready for the day, commuting to work – all of these mundane activities can be elevated to a new supernatural plane; they can be made part of an ongoing priestly sacrifice which is offered to God as an act of worship, intercession, and sanctification. From the outside, our lives may seem like unremarkable jars of clay, but the spiritual treasures they hold within are beyond compare. Previous PostChurch-a-thon VideoNext PostMerry Christmas!